Small cars and SUVs can still have big problems when it comes to the damage that regular use, dirt and environmental factors cause. 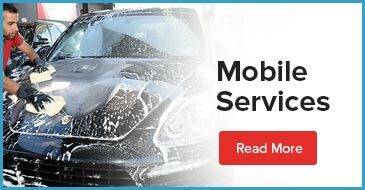 At Car Detailing Shop, we offer small car detailing and small SUV detailing packages that are designed to address the unique issues associated with small vehicles. Our interior and exterior detailing for small cars ensures you get a superior clean for your whole car. This deluxe treatment gives you complete small car or SUV detailing that includes hand waxing, clay bar treatment, and plastic restoration for your exterior. Your interior small car detailing with our premium package also includes cleaning and dressing interior surfaces, engine detailing, and much more.Short on time and need a budget friendly option? We also offer ‘Minor Swirl and Scratch Removal’ for your exterior and ‘Shampoo Package’ for interior. Each of these packages offers an à la carte option to address specific issues for interior and exterior detailing. Choose interior small car detailing to manage stains and to maintain the look and integrity of your car’s seats and carpet. Small SUV detailing for exterior is ideal for when you’ve recently taken your vehicle into a muddy or dusty environment or after a long winter filled with road salt. Our expert technicians are always available to answer questions and give recommendations on the best interior and exterior detailing for your small vehicle. Call 647-920-5199 to learn more about what we can do for your small car or SUV! Our specialty interior and exterior detailing options include deep cleaning for pet hair removal and Ozone Generator. Pet Hair Removal:Perfect for making life a little easier with our four-legged friends, our special pet hair removal will clean up all those stray strands that cause itching and aggravate allergens. Ozone Generator:Car smelling a bit funky? If regular cleaning isn’t getting out those nasty smells, our Ozone Generator will do the job. We use ozone gas to deodorize, disinfect and kill harmful airborne particles. What Constitutes Small Car Detailing and Small SUV Detailing? Small SUV detailing is specifically for vehicles that are considered mini SUV, subcompact SUV or crossover subcompact. All of these names mean the same thing: a sports utility vehicle with a length under 165.4 inches. Similarly, small car detailing is also based on the length of the car which should be under 175 inches. To get great price estimates for your vehicle type, call us at 647-920-5199. Car Detailing Shop offers convenient 100% mobile interior and exterior detailing for your car or minivan. Use our simple contact us form or call us at 647-920-5199 for friendly, knowledgeable service. We clean your car as you go about your day! We offer 100% mobile option and indoor facility option. Car Detailing Shop is the finest interior and exterior car detailing in Vaughan. Contact Car Detailing Shop today!